The past couple of days has brought a hazy sky to the area as smoke continues to float overhead as the upper-level wind flow moves the smoke from the Pacific northwest across the northern plains. In the short term there is a cluster of thunderstorms that are moving through far northeastern North Dakota through northern Minnesota. There will also be some additional storms that fire in east central to southeastern North Dakota associated with the same disturbance during the peak heating of the day around mid afternoon through early evening. These should be very hit and miss and move out of any given spot fairly quickly. The upper level wind pattern will have a large ridge of high pressure over the north central portion of the United States much of the next week. The image below is the projected heights and anomalies for 7:00 PM Sunday, August 30. That trough along the west coast will bring much cooler and rainier weather to that area that will help in the forest fire situation. This developing pattern looks to have staying power through at least the middle of next week and after perhaps a brief “cooling” period, may reform and be around through as late as September 10-15 time frame. This will mean mostly above average temperature pattern with only occasional thunderstorms, similar to what is occurring this morning in the northern Red River Valley. The smoke that is currently impacting the region, will likely continue through at least Monday. 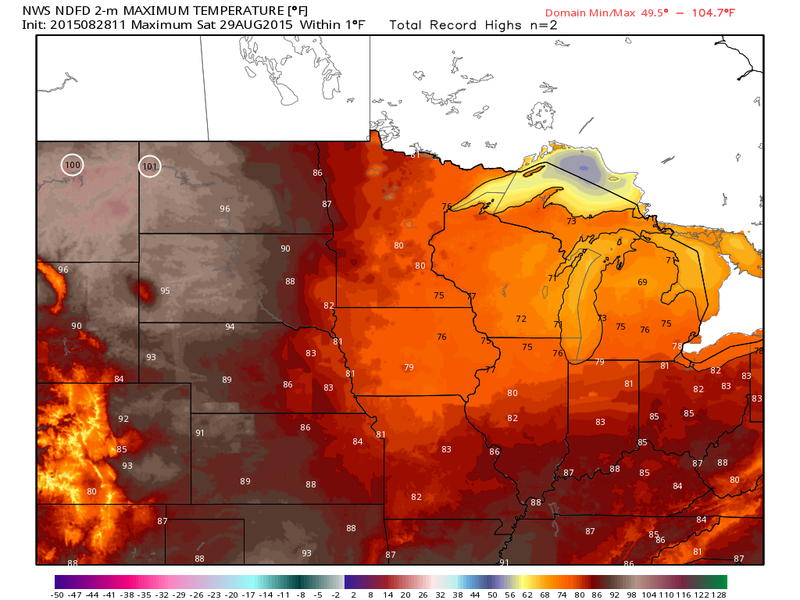 Maximums tomorrow (Saturday) have potential to reach 100° in northwestern North Dakota which would be near record high temperature levels for Williston, but such extreme heat will occur only if the smoke veil overhead is thin or minimal. As the smoke may lower temperatures from potential by several degrees over the weekend. But even with the smoke. Mid 80s east to low to mid 90s are likely, with that potential for even higher temperatures if the smoke ends up not being a problem. A late surge of summer heat as we get into the first part of September. Therefore above average temperatures, with below average rainfall is foreseen with only a few spots getting any beneficial rainfall during this time period. September is projected to finish with above average temperatures, with the current thinking is for frost potential to hold off until the September 20-25 time frame. It is during that period that an atmospheric pattern change will occur allowing for frost potential, which, if temperatures do get cold enough, would mean a fairly average first frost in many locations.